On countless occasions I have heard the expression “high-quality organization,” a broad and diffuse concept that can give rise to multiple interpretations of what is — or should be — a company and what quality means. In my classes on decision making, I always start with a premise: It is foolish to think that a company’s aim is to maximize its profits . That is just as silly as believing that a person’s purpose is to breathe. Breathing is necessary, but we do not live to breathe; money is needed for the company to survive, but operating solely to maximize profits makes no sense. This has been made crystal clear in these recent years of crisis. If we start from this premise, the term “high-quality organization” takes on a much deeper meaning. 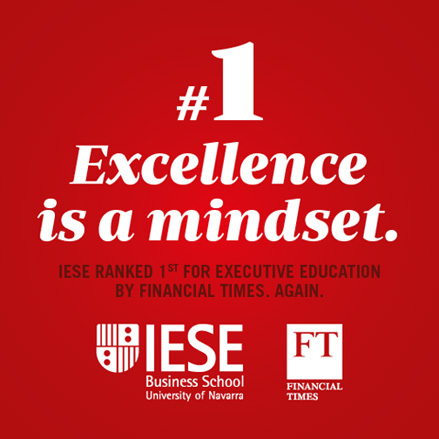 In fact, if we consider that the purpose of the company goes far beyond generating profits, it allows us to understand the three guidelines that the late IESE Prof. Juan Antonio Pérez Lopez considered necessary for laying the foundations of quality. As such, our decisions the will take them into account. In his publications and classes, Juan Antonio outlined the company profile and talked about three indispensable features: effectiveness, attractiveness and unity. Today I will focus on the first of these: effectiveness. It goes without saying that quality requires all three to be present, since they need each other. An organization is effective if it achieves the proposed objectives. A hospital is effective if it can heal its patients. A school is effective if it prepares its students. A company is effective if it meets a need. Effectiveness can be measured by metrics that are appropriate for each type of organization: that of a school could be measured by the number of students who pass the college prep test; that of a company, by its benefits. For an organization to be effective, it must have clear objectives and a good strategy: to know what it aims to achieve and how to achieve it. Any strategic decision implies discarding other options. Hence a good strategy is as much about knowing what you want to do as knowing what you don’t want to do . There are executives who have highly developed strategic capability. They know how to spot business opportunities where others do not. They know what they have to do to achieve their goals. They are effective executives. This does not mean that more effective means better. If you increase your efficiency by not investing in training or by deteriorating confidence at the heart of your organization, you are destroying future effectiveness, and therefore creating difficulties for your organization. So, maximizing sales at a given point in time may be very effective in the short term but destructive in the long haul . And compromising the company’s survival due to a desire to obtain quick profits reminds us once again of what the true aim of an organization is. Effectiveness, taken on its own, separate from the whole, does not help us measure what a high-quality enterprise is and quite possibly leads to mistakes. The other two legs of the stool are: attractiveness and unity. But we’ll talk about those another time. Miguel A. Ariño is professor in the Department of Managerial Decision Sciences. He has published articles in both academic and mainstream magazines. He is the author of the book "Toma de Decisiones y Gobierno de Organizaciones" (Ed. Deusto, 2005) and co-author, together with Pablo Maella, of the book "Iceberg a la Vista. Principios para tomar decisiones sin hundirse" (Empresa Activa, 2010). He is also the author of the blog Toma de decisiones (in Spanish).